Does it apply to all streets? 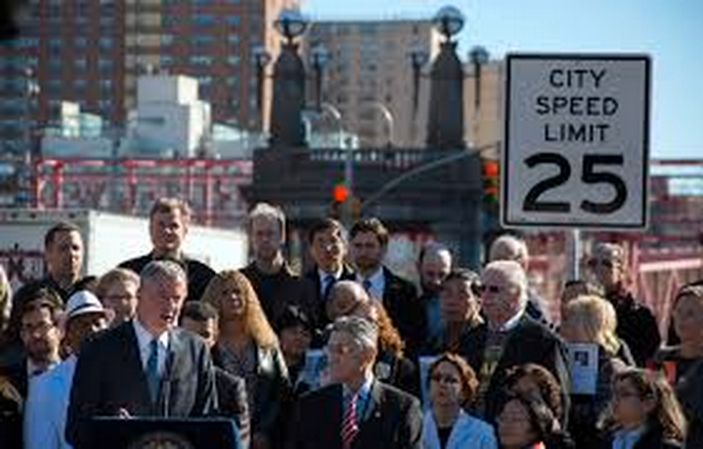 Unless otherwise posted, all streets in NYC now have a 25mph speed limit. Highways and major thoroughfares will, of course, have higher speed limits and will be posted as such. School zones will have lower limits. said that influencing drivers to be constantly aware of pedestrians is actually more difficult than convincing them to wear seat belts or to not drive drunk. as drivers get used to the new limits. being hit by a vehicle that is going 25mph than one going 30mph. , speeding kills more New Yorkers than drunk driving and cellphone use while driving put together. Mayor de Blasio and NYC have decided its worth the fight. Can lower speed limits make city streets safer? Should Rochester join the many other cities and towns across the country in determining what is best for their own streets by lowering default limits? Would your neighborhood street benefit from a lower speed limit? Pingback: RECONNECT ROCHESTER » 2014 the Safest Year to Be a Pedestrian in NYC Since 1910 ...Go Transit!